Mr Grimley-Sneer was strangled by the P.E. Master Charlies Vault in the Gymnasium using an Old School Tie. Congratulations if you got it right! The solutions to the individual puzzles are below. The special soup being served up is Borscht, which begins with B. Eliminate Benjy Blooze and Bunsen Burner Tubing. The element that is not needed is Osmium which begins with O. Eliminate Dining Room and Drama Studio. The number that goes in the starred square is 10. Eliminate Claw Hammer, Cricket Bat and Dining Room. The teacher that catches you is Hugo Filings. Eliminate Hugo Filings. The letters in the circles spell can be rearranged to spell "gymnasium". The letters in the stars can be rearranged to spell "Ramona". Eliminate Gymnasium and Ramona Isosceles. 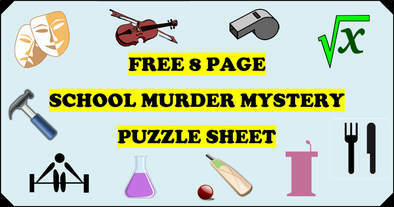 Think your friends would enjoy this murder mystery puzzle?